If you’ve ever spoken to a recumbent cyclists for any length of time, you’re probably well aware of the superior aerodynamics of the comically shaped machines. A new brand named Bird of Prey is taking that concept and literally flipping it on it’s head. Rather than laying supine, this new bike places riders in Superman style riding position. 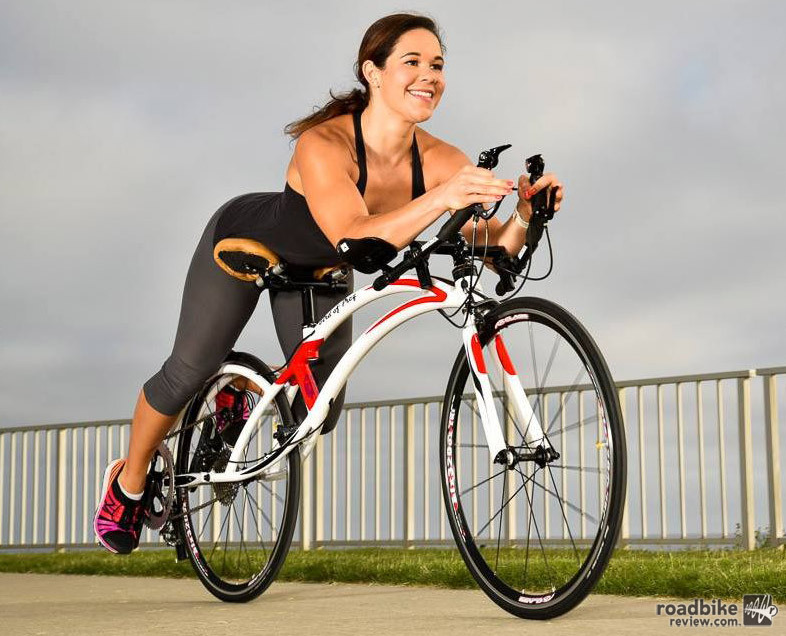 This position allows riders to easily see the road the ahead, while offering many positive attributes – such as improved aerodynamics and a lower center of gravity. Highway 101 Carlsbad, California, June 15, 2014. When riding, the hips are supported by soft leather supports, while the elbows are locked into aero bars. This is presumably a boon for riders with back problems, as this position does not compress the spine like traditional sit down bikes. It also puts riders in a similar position as swimmers, allowing them “to push and push on the pedals as if [they] were running with legs fully extended.” This allows riders to push higher gears than traditional bikes, the standard gearing on a Bird of Prey is a 60 t (“rear” chainring) mated to a 36/11 cassette. Each of the frames is custom built to order in the United States. They utilize standard components and depending on the size and build, prices range from $7,000 – $8,500. For more information visit birdofpreybicycles.ning.com. Kudos for creative thinking. But. Sitting upright on a normal saddle allows you to use your legs as suspension. Laying prone on that thing will beat your organs to a pulp. Balancing seems suspect with entire weight mass teetering above center of balance. The body angles surely put you at a disadvantage to strong pedaling. Don’t even want to think about how vulnerable you’d be in a crash situation. It does not have disk brakes……. I would like to know why this novelty bike is priced like a professional grade road race, or a pro full suspension rig. This is not a $7K-$8K contraption…. It just isn’t. It is a “hey, look at me on my extra special bike.” My head hurts just thinking about how you would need to have your neck hyper-extended all the time just to ride this thing. I could see it being a good short term downhill ride with its 60T chainring. C… This is going to do terrible damage to the pelvic organs. I can see already the potential for torn ureters or a ruptured bladder in a crash, IF, that is. the rider doesn’t go launching over the handle bars like a friggin patriot missle. Expensive uncomfortable stupid bike is stupid. All it needs are a set of Backup Barz for when you want a more upright position. My bladder hurts just looking at that. They should name this bike The Clavicle Crusher. Every rider knows: eventually you crash. And this bikes puts the body in a position where a normal crash becomes catastrophic. Imagine if a car door opens on you at 25mph. Seriously!? !….another case of “because we can” design and a pretty silly one at that (I’m being nice by saying silly). Just “because we can”, doesn’t always mean we should. I’d completely get it if today was April 1! Truthfully, I’d be curious to try it. On the other hand I have enough trouble finding a 62cm road bike to ride. Forget a 24 MTB. So imagine the price tag and size of one of these for me who stands 6′ 6″ tall with a 36 inch inseam. I doubt that it would even fit my rack. It looks like the weight distribution is heavily biased toward the rear wheel, with a substantial amount behind the rear axle. Combine that with the aero bars only design and you’ve got a recipe for disastrous handling and very poor low-speed maneuverability. I watched the whopping 14-second video on their site of a rider pedaling at a ridiculously slow cadence on a velodrome. That was really confidence-inspiring! This is an attempt to take a position that’s only used in IHPVA streamliners to the mass market, which is a bad – and dangerous – idea. I suspect that this is the first and last time we’ll hear of this monstrosity. The descent on this bike looks dangerous. The bike wobbles and the rider can’t keep a line. With this riding position you can not shift your body weight while riding. Creative idea, but not practical. Hope they never attempt to make a tandem! No picture from behind? Why not? I designed a similar bike 20 years ago and abandoned the design for safety reasons, as well as, not being able to build the prototype because of an economic hardship, but it is both heartbreaking and refreshing to actually see my old dream come to reality-congratulations! Now find a way to lower the cost and you”ll have a winner. For folks with back problems? Ha! Look at the backward curvature of her spine. Time will tell if this catches on. What if you can go 25 mph with the same effort level it takes to go 20 mph on a traditional bike? I used to ride recumbent a lot for the added speed alone, and it was also more comfortable. I eventually switched back to roadbike because I like riding in a group which is awkward on a recumbent, and there are a lot of hills around here which also don’t work well for the recumbent I had. You’d always get comments on how goofy they looked and how comfortable it must be but most people didn’t realize the big benefit in speed. The reason these aren’t seen in road races is the UCI outlawing them for racing many decades ago (look it up), and thus the dominance of the upright bike. If the bird of prey can in fact be ridden in a triathlon as mentioned in the video (different from recumbents) this would be a huge rider advantage, and the $7k cost totally within range of what serious triathletes spend. As for all the “this is a terrible idea because of X” posts – you guys are pathetic trolls who think it’s better to put down someone else’s idea and hard work, whatever the merits (or even lack thereof) may be rather than actually trying out for yourself or wait for an editorial review. Your mental masturbation is not worth anyone’s time. Go ahead reply with some hate just to confirm what I just wrote. Triathlons aren’t necessarily “big fancy races”. There are several local triathlons all over, and you can pretty much ride whatever bike you think works best for that terrain. The point of a triathlon is not about speed, but endurance. Triathletes actually need good handling capability of their bike, not just lightweight/aerodynamics. 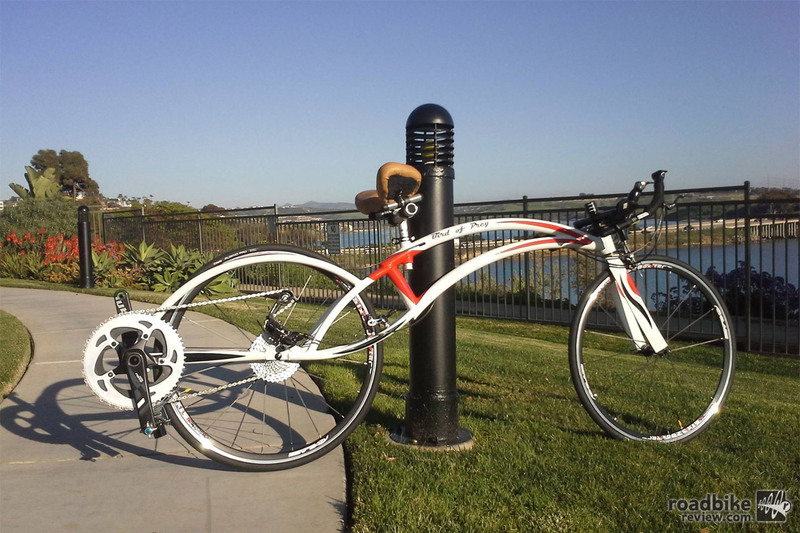 If this bike really benefited serious triathletes, let alone, ANY triathletes, they would be using it.